ART | "Fire & Ice"
It's too easy for us to take our environment for granted. 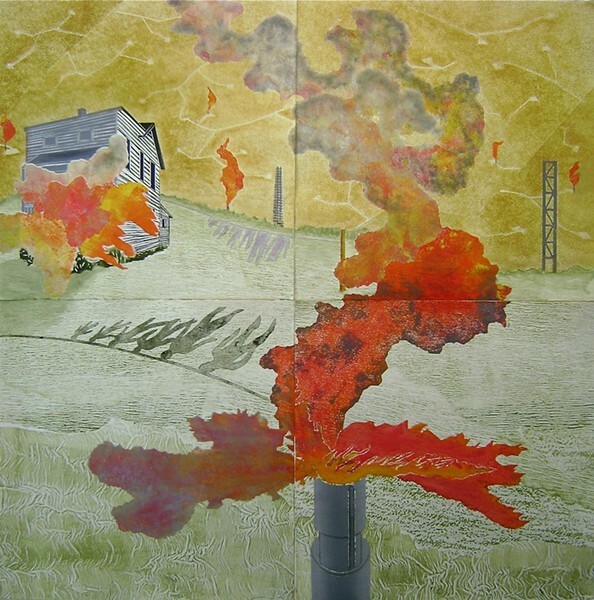 Regional artist Barbara McPhail's drawings and prints celebrate the beauty of the Delaware River Valley, but her work also promotes the preservation of that region, and others across the country, that have been targeted by energy companies who want to use hydraulic fracturing — better known as "fracking" — to get at what's below the surface. A collection of McPhail's artwork will be displayed in an exhibit, "Fire & Ice," that opens at Williams-Insalaco Gallery 34 (Finger Lakes Community College, 3325 Marvin Sands Drive, Canandaigua) on Thursday, January 30. The artist will demonstrate her unique printmaking process from 11 a.m. to noon in room C429, an artist's talk will take place 1-3 p.m., followed by a reception from 4 to 6:30 p.m. All events are free to attend. The exhibit continues through February 27. Gallery hours are Monday-Thursday, 8:30 a.m.-9 p.m.; Friday 8:30 a.m.-5 p.m.; and Saturday-Sunday, noon-5 p.m. For more information, call 785-1369 or email gallery34@flcc.edu.